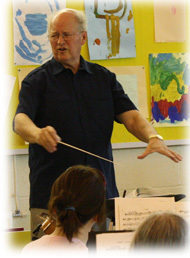 Jerry Lanning is a highly experienced conductor and arranger, with hundreds of published works to his credit. A graduate of the Guildhall School of Music, he studied conducting with the legendary George Hurst and also with Lawrence Leonard. He has conducted in most of London's recording studios and for several years he arranged for and conducted the BBC Radio Orchestra, and also wrote and conducted for the world-famous Readers' Digest compilations. He has taught part-time at Wycombe Abbey School and Bradfield College, and is a regular guest conductor with a number of UK orchestras and concert bands. At the Charterhouse Summer School (CSSM) he formerly directed the Symphonic Wind Band and the wind chamber ensembles, and regularly directs large wind chamber music workshops around the country.